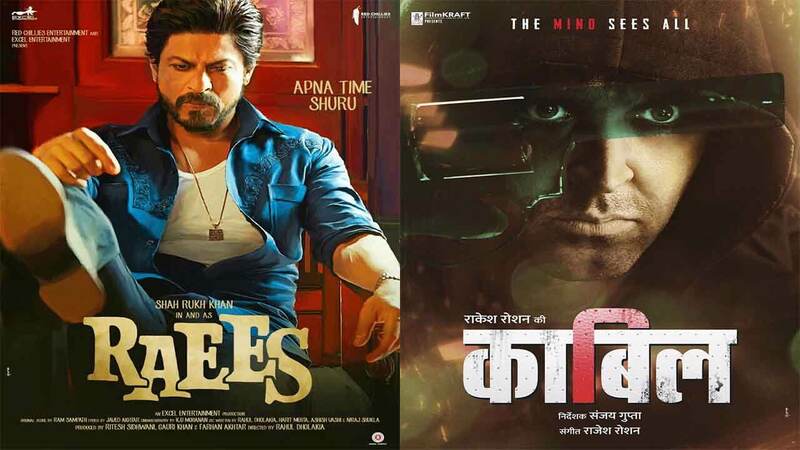 Jan 25th was slated to be the battle of the stars- Shahrukh and Hrithik battling it out with Raees and Kaabil respectively. The swords were all out with both the parties battling it out with their PR machinery. Some even called it as a mentor-pupil battle. And it mattered for both the stars as their previous movies were almost a washout (Fan and Mohenjo Daro). While SRK’s ‘Raees’ reminds one of the Amitabh in good old Deewar and Manmohan Desai days, he tries very hard to play a Robinhood character loosely based on a real life story of a bootlegger in Gujarat in the prohibition era. However he gets only 2 things right with his movie in the current election scenario- Modi’s Gujarat and the frequent use of ‘chai’ as a metaphor for victory! Even our background dancers have better emotions on their faces than Mahira Khan (Aasiya). She owes MNS a big ‘Thank you’ for giving her more publicity than she deserved. Nawazuddin (ACP Majmudar) comes up with another stellar performance as a cop, though his style is getting repetitive, but is left with no good dialogues to support his acting with. Atul Kulkarni (Seth) makes a comeback, but doesn’t have a strong role to explore his acting potential. Sunny Leone gyrates to the remix of ‘Laila’ but even her fluid gyrations fail to save the stale script. Some forgettable songs fill up the 2+ hours and there are more villains in the movie than scenes at some point. One can’t fathom why SRK’s character – Raees- grows up and goes on a rampage like a mad elephant, killing everyone who comes his way in the most predictable ways. Rahul Dholakia looks very rusty after a long hiatus as a director and seems to have run out of ideas while making the movie. SRK looks jaded though a bit younger…but certainly doesn’t justify 24 years!! If you are having a Netflix hangover, you will end up finding many similarities with ‘Narcos’. On the other hand Kaabil tries hard to be a different love story by having two blind protagonists- Rohan (Hrithik) and Supriya (Yami Gautam) who are introduced by a good friend Zafar (Suresh Menon in a wasted role). However this movie is ‘inspired’ by a Korean movie and smartly adapted by Sanjay Gupta with a Jazbaa hangover. Supriya soon gets raped by Amit Shellar (Rohit Roy with the same expression throughout) and supported by his elder brother who is also a corporator- Madhavrao Shellar (Ronit Roy with the same ‘Udaan’ expressions). Girish Kulkarni (Inspector Nalawde) seems to be specializing in a corrupt cop role and plays it to perfection along with Narendra Jha who is a common factor between the two films. He is the cop (Inspector Chaubey) in Kaabil and a Don (Musa) in Raees. The rest of the movie is a matter of time how Rohan goes around killing his enemies without leaving any clues behind. In fact, the director gives us enough clues in the first half about manner of the revenge. Sanjay Gupta seems to have been given a limited budget as most of the scenes are indoors or on a set. Hrithik has a puffed up face without a range of expressions, Yami looks pretty but has less screen time. Music is passe except for a decent score of ‘Mon Amour’ though Hrithik doesn’t go beyond his trademark dance moves. Bollywood January could have definitely been better. But if the movies are a battle of the stars, then the result seems to be a blackhole! Of course box office numbers will deny it by propping the figures once again. But the acid test is that Dangal is still doing as good or better than both the movies!